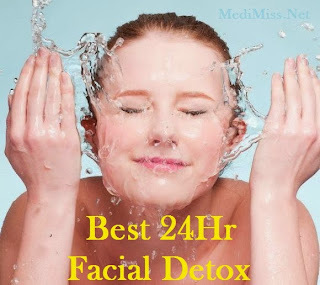 A 24 hour facial detox begins first thing in the morning and involves a combination of foods, juices, teas, spas, exercise and facial masks that come evening time you will have totally exfoliated and rejuvenated your facial skin tone. Start the day off with a glass of water followed by some fresh fruit, ideally insoluble fruit that will pass through intestine and act as a detoxifying laxative while you absorb all the nutrients. Such fruits that don't form a gel when they come into contact with water are blueberries, guava and avocados. Follow that up with a green tea, preferably one that contains a mixture of green tea catechins, the most powerful being Oolong, Pu-erh and Green Select Phytosome. Nettle, lemon or ginger tea also detox the gut and additional flowers and herbs can help sooth inflammation as does GTC. If you can afford it, Alpha hydroxy fruit peels which work to remove a dead layers of skin will provide a perfect relaxing midday where you can sip on any number of detox smoothies, for example an aloe vera and raspberry juice which is excellent for topical and cardiovascular detoxification. These fruit peels will cool the skin removing any redness built up from the previous day. Ionisation with gentle cleansing creams will help with darkness around the eye and for older skin try aloe vera and vitamin C packs. Follow your detox peel with a lymphatic massage which can be carried out by a machine or done manually at home. By aiming a jet of water at the lymph node, it helps transport toxins and allergies that cause swelling to drain, urging waste to pass on through the lymphatic system. By adding nutrients to the skin this will help polish your skin tone. The most natural way to continue to exfoliate the skin is to carry out an aerobic exercise. Running, swimming, cycling or something less strenuous like yoga will eliminate remaining toxins from the body as aerobic workouts are better for stimulating the lymphatic system. After you've cooled off, follow this up with a facial scrub. Papaya, strawberry and oatmeal, strawberry seeds or fresh grated apple are wonderfully enriching facial scrubs with plenty of natural enzymes and vitamins like A and C are perfect for obtaining softer facial skin. Clay masks and steam will help pull the remaining toxins out and help calm the skin. Follow this up with freshly sliced pieces of cucumber or raw honey covered with a cool face cloth that will curb any anti-inflammatory puffiness, leaving the skin a soothingly, cool and rehydrated soft texture. Top this off with a final cup of green tea catechins to flush and cleanse the body's organs while you settle in for relaxing smooth night's sleep. Taking green tea catechins - GTC - is one of the best ways to detox and diet at the same time if your serious about detoxification.